Patent trolls are a gaping wound on the innovation economy. Despite growing evidence about the trolls’ economic damage, the U.S. government is still grasping for ways to stop them, and to fix the country’s dysfunctional patent system. On Thursday, the White House plunged forward with a new series of measures intended to curtail the troll plague that is siphoning money from productive companies while producing nothing of value. The plan is clever, relying on crowdsourcing tactics to expose trolls and bad patents. Unfortunately, it won’t kill the trolls. Here’s an overview of the new troll-fighting tactics and what they will — and won’t — do to fix the patent problem. That toolkit will be powered in part by websites like Lex Machina, an analytics company that helps companies take a “Moneyball” approach to intellectual property litigation by providing data about troll behavior. Specifically, the U.S. Patent Office will begin linking to a Lex Machina tool that lets troll victims upload and compare demand letters — which are the legal cudgel that trolls send out out by the thousands to threaten businesses. According to CEO Josh Becker, the tool will help correct what he describes as an information asymmetry that empowers the trolls. While the demand letter tool will allow troll victims to get a better idea of who is trying to sue them, the White House also announced another tool intended to help kill trolls altogether. Namely, the patent office will provide a forum for people to share prior art — documents that can show a patent is invalid because an “invention” is obvious or exists already. The White House announcement also included new executive orders, including one that will shine more light on the thousands of murky shell companies that giant trolls like Intellectual Ventures use to make legal threats. The new order will require the “reporting of people or companies with ownership interests in a patent or application, called the ‘attributable owners. '” In practice, this will mean a troll using a name like “Innovation LLC” (trolls are fond of tech-y names) will have to disclose who owns the shares in the LLC — and expose themselves to a moral rebuke for engaging in a troll business that has been castigated by everyone from NPR to the New York Times to the Wall Street Journal. The new executive orders also call for additional training for patent examiners and judges to assist them with the technical business of “evaluating functional claims and improving examination consistency.” This measure may, in theory, stanch the flood of bad patents that has given rise to the patent troll business in the first place. Finally, the new White House executive orders also call for more pro bono assistance to help small inventors navigate the patent system, and new guidance for the Internal Trade Commission on patent-related import bans. Remarks by President Obama during the State of the Union address, and by NEC director James Sperling at a patent discussion in Washington, show that the White House clearly understands the problems with the patent system and wants to fix it. The measures announced on Thursday, however, fail to do this. The problem, and it’s a huge one, is that all of these measures will do nothing to prevent the most pernicious trolls from carrying on business as usual. While the transparency elements are nice, it’s hard to imagine that public shaming will cause the likes of Intellectual Ventures or Erich Spangenberg — who boasted to the New York Times that he earns $25 million a year by “going thug” — to hang up their troll hat. And while crowdsourcing prior art could be an excellent way to expose flawed patents, the new tool will be nearly useless without a practical way to invalidate those patents. As it stands, the only option for troll victims will be to use the prior art in federal court against a troll’s shell company. And even if they win, they are likely to be stuck with a million dollar legal bill — meaning it will still be cheaper to settle and pay the troll to go away. In short, the basic economics of trolling are the same as before. This shortcoming is the not the fault of the White House, which can only do so much through executive orders. The real opportunity for reform is in Congress, which is expected a patent bill called the Innovation Act this spring. Unfortunately, the most promising part of that bill, which would have expanded a low-cost method to knock out bad patents, was stripped out last fall in response to pressure from old guard companies. Meanwhile, the trolls are alive and well – they’re even branching out to tax new industries like pharma and biotech. The bottom line is that, even though all three branches of government are now working to fix the patent system, the trolls will be with us for the foreseeable future unless Congress provides a stake to kill their patents. The best way to get rid of the so-called “troll” …uhh … “problem” … is for entities to stop infringing on patents. No infringement = no infringement lawsuit. Problem solved. How about the real problem — infringement — be addressed? @Jeff, how about writing an article explaining how an inventor is to best assert his patented intellectual property rights against infringers, and how trying to stop patent trolls by reducing the means for assertion actually damages the incentive from inventors to innovate? Mike, thanks for your comment but I simply don’t follow your argument. At this point, I think the onus is on the trolls to make the economic case for why the immense litigation and other transaction costs they are imposing on the business community is possibly justified. We are way past the point where we can simply take it on faith that awarding property rights on any concept, no matter how trifling, is yielding an economic benefit to society. The current patent system is benefiting a handful of trolls (and their lawyers and PR teams) at the expense of everyone else. Infringement is a huge problem in a growing culture of dot communists who think anyone’s creation is theirs to copy and distribute at will, be it movies, music, software, circuits, etc. Bashing on trolls is the wrong direction in seeking to preserve an innovation economy, but order of magnitude decreases in the costs and information barriers to opposing them in a binding legal forum will be a much needed improvement. Like free speech, the rights of one cannot be curtailed without limitations on the rights of many. The current patent system is one of the top two or three reasons why we have an innovation economy. The lure of striking it rich and having exclusive rights vigorously enforceable against competitors harnesses human drive to innovate. That lure is second only to the now waning spirit of American settlers to make their fortune in a land given the opportunity. Calling the patent system broken ignores what it has done and continues to do for us. Take it away and you will see how quickly we devolve to a copyist economy and stop leading technology solutions. Having managed hundreds of patents through patent offices around the world, I have yet to see a trifling innovation make it through the US based on what is known at the time of patent examination. US patent examiners are characteristically obstinate and highly motivated to err on the side of rejecting legitimate inventions. The problem of mistakenly protecting trifling innovation is not in the patent system, but in the limit to knowledge for decision making. Improved searching capability of the exponentially growing body of technical information should make a difference in reducing the number of issued patents immediately worthy of invalidation. Troll victims need to become accustomed to challenging patents in the Patent Office instead of taking the million dollar litigation option and litigation reform is needed to facilitate it. Jeff, just FYI: I am an inventor and patent holder. So I’m genuinely curious. What is it about this argument (encapsulated below) that you find difficult? 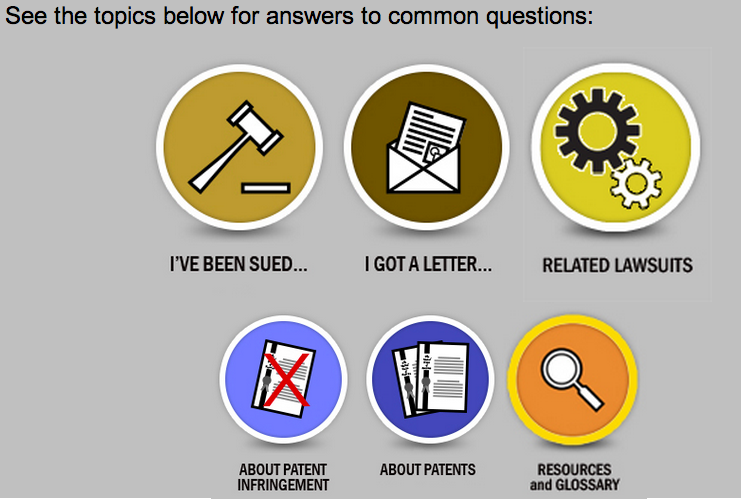 2) patent infringement lawsuit (aka patent assertion) logically follows. So, if one wants to avoid 2) — an infringement lawsuit — then one must simply avoid 1) — infringement. No infringement = no infringement lawsuit. Problem solved. This is a very simple argument, and I’m curious as to why you don’t follow it. Moreover, I don’t follow your “onus is on the trolls” comment. Corporate giants, taking advantage of their giant operating budgets, simply do not respond to licensing letters (telling small inventors to go pound dirt), nor do they, on their own fruition, offer to pay out settlements to patent holders if they infringe on patented technologies. “If you want what we stole, come and take it,” is their battle cry. So the only recourse then, upon an infringement discovery, is for patent holders to take them to court and assert their patent rights upon those who infringe. Then and only then, by court order or the threat thereof, will the business community do what is just in giving a fair share to use the patented technology. Using the courts is unfortunate, but I ask you this: Which came first? The infringement or the lawsuit? So your comment “the onus on the trolls to make the economic case for why the immense litigation and other transaction costs they are imposing on the business community is possibly justified,” I don’t follow this argument. Rather, the onus is on the business community for making the case as to why they do not give credit where credit is due, in the form of licensing inventions by the innovation community and paying out rewards if they stole and profited (aka infringed). It is the business community’s willful ignorance of acknowledging rightful credit for innovation that is forcing the hand of, and creating the market for, so-called patent trolls. So why is this? Well, simply because big business can afford to ride out a legal battle until the small inventor has no more cash. Therefore, small inventors cannot assert their patents because the business community INTENTIONALLY CREATES IMMENSE LITIGATION, and and such, the market of patent “trolls” was born. So which came first? Big business trying to kill small inventors via long, drawn-out legal battles? Or the patent troll response. Similar to Jim’s comment, if we strip away the rights of patent holders by focusing on the wrong problem in the attempt to curb the trolls instead of focusing on the real problem – infringement – we will then live in a dot communist era where innovation will cease to exist. Why? Because there will be no guarantee or protection of one’s inventions. The larger fish in the business community will continue to eat the smaller fish until the ocean only has one big giant species of great white sharks having no food supply. Why swim in those dangerous waters? Surely you are not a dot communist Jeff. I would love to hear your comments on this. Excellent response and very accurate. I hope the Senate takes a slower approach to patent reform compared to the innovation killing bill the house passed.